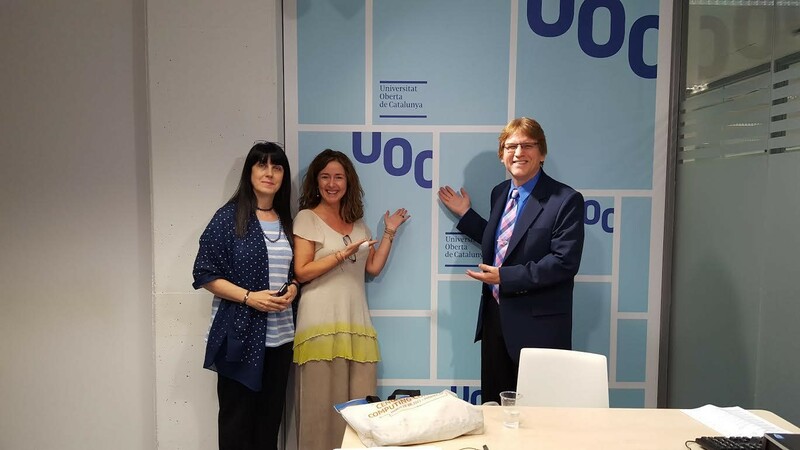 On June 21th, the Edul@b research group organised a meeting in Barcelona between the researchers from the group Nati Cabrera, Lourdes Guàrdia and Marcelo Maina, the UOC researcher Maite Fernández, and the researcher and professor Curtis Bonk from the University of Indiana. Professor Bonk, as an expert in Open Education and especially in MOOCs, initially became interested in the latest publication by one of the group’s members, Nati Cabrera “Examining MOOCs: A comparative study among educational technology experts in traditional and open universities” in the journal IRRODL, as well as in the possible connections with the investigations and the publications that are being carried out at the moment. Subsequently, the professor also showed interest in knowing the UOC, and specifically in the activity of Edul@b in relation to the Learning Ecologies. The researchers took the opportunity to speak and exchange views on new trends in online and distance education, the current state of MOOCs and Open Education. The meeting was very rewarding and both professor Bonk and the members of Edul@b showed their interest in carrying out future collaborations in the form of projects and joint publications, as well as new meetings.